In case anyone wants my testimonial, making 4 cupcakes is such a breeze! Cupcake-making can feel like a project to me - what with scooping the batter into their cups, making the frosting, then decorating each individually. When I made these four, I was done before I knew it. I don't have a hand mixer so I simply used a whisk to make the cupcake batter and the stand mixer to whip up the frosting. The little batch of cupcakes do disappear as fast as you can make them but for me, there's satisfaction in that. I know I'll be back in the kitchen whipping up something else up again and that's just what I want to do. We probably don't make or eat red velvet cake very often due to large part to that red food coloring we have to use. For what it's worth, I used just 2 drops of red gel paste food coloring, which is what I already had on hand and is a lot more intense than the liquid kind. Food coloring isn't something I'd want to use often but sometimes you just have to. The oil in these cupcakes kept them so moist. And there is definitely a wonderful alchemy in the combination of buttermilk, vinegar, and cocoa that makes for a delicious result. As for the classic cream cheese frosting - it's easy to make and so smooth, creamy, and tangy. I took out my Wilton 1M pastry tip again and had a little practice piping out the frosting on the cupcakes. 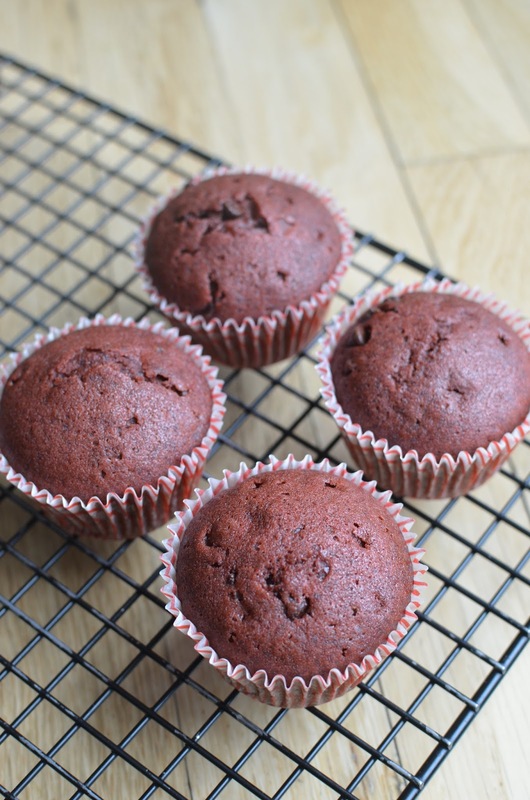 The recipe makes enough to frost these 4 cupcakes generously. Update (November 2015): The last time I made these cupcakes, my little guy was talking about how great they would be with chocolate frosting instead of cream cheese. We're all about the chocolate at my house! Well, I know it isn't usually done, but why not? So I recently made a batch of these cupcakes with some chocolate ganache frosting (below). I can tell you they were very popular! Make cupcakes: Preheat oven to 350 degrees. Place cupcake liners in 4 cups along the edge of a a standard muffin pan. In a medium-size bowl, whisk together (you could also use an electric mixer on medium speed) the oil, sugar, buttermilk, egg white, food coloring, vinegar and vanilla. In a separate bowl, whisk the flour, baking soda, salt, and cocoa powder to combine. Add dry ingredients to the wet and gently stir together with a rubber spatula. Add chocolate chips, if using, and stir until just incorporated. Divide batter among the 4 prepared muffin cups. Bake until a toothpick inserted into the center of a cupcake comes out clean, about 20-22 minutes. Let cool in the pan for a few minutes before removing cupcakes from the pan to a wire rack to cool completely before frosting. 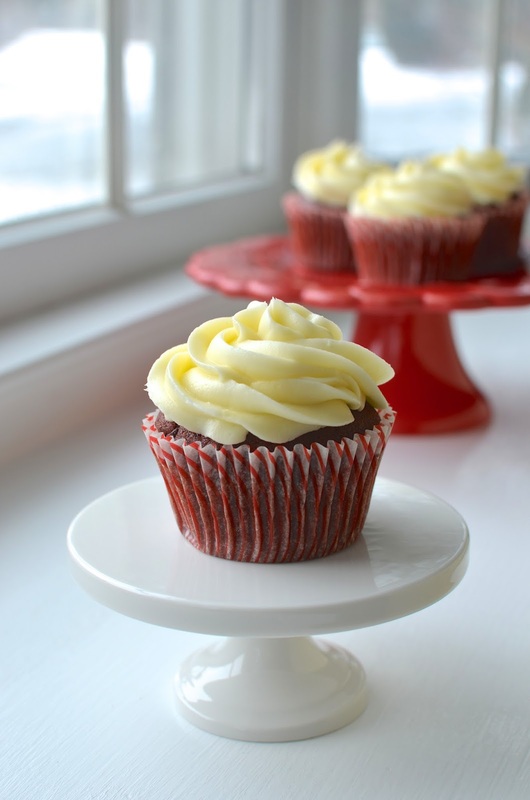 Make frosting: Using an electric hand mixer or a stand mixer, beat all the frosting ingredients until smooth. Frost the cupcakes, as desired. I transferred the frosting to a piping bag and used Wilton's 1M pastry tip to apply the frosting. These cupcakes are so adorable, Monica. Love those beautifully and professionally piped frosting. I wish I could taste one now. Thanks, Angie. Cupcakes are so pretty to look at, aren't they. I get my 'fix' by admiring professional ones most of the time. Have a good week. Yay, so glad you tried red velvet cupcakes! They seriously look perfect! The chocolate chips are such a great addition and you frosted them so pretty! I love that this recipe is for a smaller batch too! Everything that you make/bake is a fantasy food for me - it always looks amazing. Just like these cupcakes. I can't imagine a more perfectly rounded top and scrumptious texture. The icing is perfectly piped - you must spend a lot of time in bakeries studying the baked goods because you know exactly what they are supposed to look like. Red velvet is my personal favorite - and the one my mother always made for my birthday. Love cream cheese icing! If I ever get my post done I hope you'll see I also made cream cheese icing this weekend - because we are soul sister/bakers! Cupcakes are serious eye candy, I think! I adore how smooth the frosting is and I definitely agree with your description of it. Im not a cupcake person at all, but I do fancy a red velvet if any...I think it's the frosting. I don't like the sweet buttercreams. Cream cheese frosting is my favourite. Your cupcakes are beautiful Monica! So, the verdict? Would you pick a red velvet over a chocolate with ganache? Nazneen, some things don't change and I'm still your chocolate with ganache girl but now I know if that's not an option and I must have a cupcake (what a hardship), the red velvet is a very good option. : ) I keep hearing that red velvet from some bakeries aren't very good though...I do know these 4 babies were quite delicious. Have a great week! Making 4 of these is so perfect for me. Red velvet is so pretty...and I'm happy to have a tasty recipe on hand now, too. Most bakery red velvet cupcakes aren't that great, so I think it's probably wise that you've avoided them thus far. I NEED to try these from Christina's book! They sound so good...and definitely awesome that the recipe only makes FOUR. Because...any more and I'd be in trouble! Your cupcakes are so pretty. And I love the sound of that cookbook! Leftover desserts can be very dangerous. I was very impressed by the cookbook - looks great, good/easy to follow recipes, nice pictures. In so many cases, things are best eaten fresh so I love a small fresh batch. Thanks - hope all is well! Thanks so much. And you're right, Cathleen, who wants to see perfectly tasty homemade baked goods go to waste. The more there is, the more we'll eat. A little moderation works for me. How handy! I'm always a fan of small batch recipes; it's a nice way of indulging yet not over-indulging haha. And the chocolate chips are always a plus! Sometimes, I like to stuff my red velvet cupcakes with Nutella hehe. By the way, your frosting looks beautiful! I love small batches and divide recipes in half all the time. This is even better when the math is done for me! These look delicious! Love the swirl of frosting. yum! i am craving these cupcakes now! Hey, my blog is a food learning blog, too!! I'm no expert at all, I just try new things :) Great cupcakes! Yay! It's great to have a place to "document" that things you made and I'm always learning something in some way. It's great. Thanks, Ashley! I'm with you, the chocolate chips are critical :) And the frosting looks perfect! What a perfect little treat. More chocolate, the better, I say! : ) Thanks so much! Same in my house, my husband would be happy with plain red cup cakes, but I would love it with frosting. They must be terrific with chocolate chips. There are definitely cake people and frosting people and sometimes we meet in the middle... : ) You know I love chocolate so I'll almost always say things are better with some involved. Hi Jo, it doesn't feel too bad when I use 2 drops of the coloring to make these 4 little cupcakes...though I know the 2 drops are very concentrated. Oh well...gotta live a little, right! : ) Hope the kids are doing great! Not sure why my comment did not show up here when I posted it along with the churros post. Glad I checked though. The cupcakes are perfection...so pretty! The chocolate chips are welcome for me in cupcakes of any flavor or size. Small batch makes them even better. Bookmarking this recipe! Thanks for checking and taking the trouble to resubmit your comment. : ) Desserts are generally so pretty, aren't they? I'm *almost* happy just looking at them sometimes. These cupcakes look so so yummy!